Both sides are renowned in the league for their high pressing, counterpressing and generally intense defending, thus it was no surprise that these were a major part of the game. Liverpool’s ability to prevent Spurs building attacks from deep effectively stood out and had a large effect on the flow of the game. One major factor was Liverpool’s typically strong ball-orientation which allowed them to prevent easy progressions on the ball side. 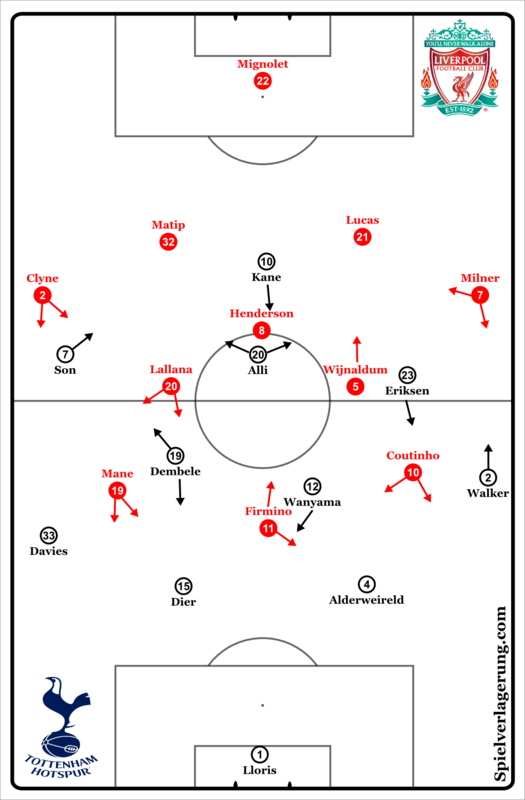 Furthermore it invited difficult, long distance passes to the seemingly open side, where the time taken for the ball to land allowed Liverpool to create pressure in the surrounding area. When Spurs tried to build-up from Lloris, Liverpool often left Spurs’ centre backs free to receive the first pass before they started pressing. By doing so Liverpool could tempt Tottenham into passing out and thus attempt to force turnovers in their half leading to more dangerous transitional attacks. When Dier or Alderweireld received the ball they would be pressed diagonally by Liverpool’s ball-near winger, with this pressing angle designed to block the pass into the nearby full-back. Firmino would drop deeper slightly to block the passing lane into Spurs’ nearby midfielder. Whilst he was not always directly blocking the route into the centre, his positioning allowed him to threaten these passes with interceptions or aggressive backwards pressing. Due to the large distance between the Tottenham centre backs in these situations, Firmino was not concerned with blocking switches between the pair. Liverpool’s ball-far winger would move centrally to block diagonal routes into midfield but was also constantly aware of switches to the nearby centre back, and the long distance the ball would have to travel encouraged them to press these passes aggressively. In midfield the ball-near 8 was initially responsible for pushing forward to mark Spurs’ closest midfielder whilst the ball-far 8 would assist Henderson control the 10 space, whilst retaining access to Spurs’ ball-far holding midfielder. Full red arrows indicate actual movements, whilst the more transparent arrows are movements they often made out of the shape. When the London side made switches in deep build-up the winger on the ball’s new side would approach Dier or Alderweirled with a different body position, aiming to block the central pass instead. This gave the midfield players more time to shift across, and the nearest 8 would move wide to press the full-back if the ball was successfully forced out wide. For much of the first half, Pochettino’s men were unable to build-up effectively against this pressing. Liverpool’s ball-near mechanisms and intensity blocked easy routes forwards on the near side, and their positioning allowed them to press long switches intensely. On the occasions that Spurs were able to pass into Wanyama or Dembele in build-up, the pressing from Lallana or Wijnaldum respectively prevented them from turning out, forcing return passes to the centre backs in the process. The pressing Liverpool midfielder would use this momentum to press the receiving centre back whilst covering the midfielder behind them. This combination of increasing pressure and restricting passing options was often enough to force the ball long or back to Lloris. By unsettling the away side’s build-up, Liverpool were able to set-up advantageous opportunities to counter against a team still transitioning from their shape with the ball to close spaces without it. Both goals, and several other chances came from Liverpool’s threat in counter attacking situations and there were a number of aspects behind their efficacy in transition. One interesting feature was how they recovered the ball to set up these transitional attacks. Through players such as Firmino working back from higher pressing, or at times the likes of Mane pressing aggressively towards the centre from wide; Klopp’s men were able to benefit from the advantages of blind side pressing. By approaching opponents from the blind side, they could nick the ball away from unaware opponents. This was clearly a result of trained instincts to collapse on the ball in central areas, allowing players to press in a multi-directional manner. Perhaps the key factor of these counter attacks was diagonal runs from the likes of Firmino and Mane. Firstly these runs offered the ball carrier the chance to split the opposing defence with through balls. Furthermore, the diagonal movements from Liverpool’s forwards moved Spurs’ backline into narrow positions to cover, allowing more space for counters from wider areas through the likes of Clyne. These movements also acted as space openers, creating more room for the ball carrier to dribble by tying Spurs defenders back into deep positions. Through their runners in either half space, Liverpool often had the ability to switch the direction of their attack. This was crucial in giving them a level of unpredictability and allowing them to access the far side quickly. This was particularly useful in allowing the likes of Clyne and Mane to use their superior speed against Davies to enter the box and create dangerous situations. The London side often lacked directional access in their counterpressing, meaning that they could put pressure on the ball, but couldn’t prevent Liverpool from exiting the surrounding area and countering through the far side. The 2nd half was a largely low quality encounter with very little flow to the game due to a number of issues on both sides’ part. In the early part of the 2nd half, Liverpool were able to sustain periods of possession in Tottenham’s half, allowing them to wind down the clock with little danger posed to their lead. One factor behind this was their pressing, although Pochettino had moved to a 4-3-1-2 earlier in the first half it failed to have the desired effect in build-up. The Argentine’s plan may have been to have a wider base in midfield, occupying Liverpool’s wingers, and thus creating more space for the full-backs to build. Or to engage both Liverpool’s 8s in a higher press, opening passing routes to the likes of Kane and Alli in the process. However Liverpool were able to deal with Spurs’ wider midfield by adjusting the positioning of the ball-far winger. They would now play even narrower than previously give immediate access in the event of Spurs’ playing diagonally to Eriksen or Dembele/Wanyama. However they were still able to combine this with sprinting forwards to press any switches between the Tottenham centre backs. 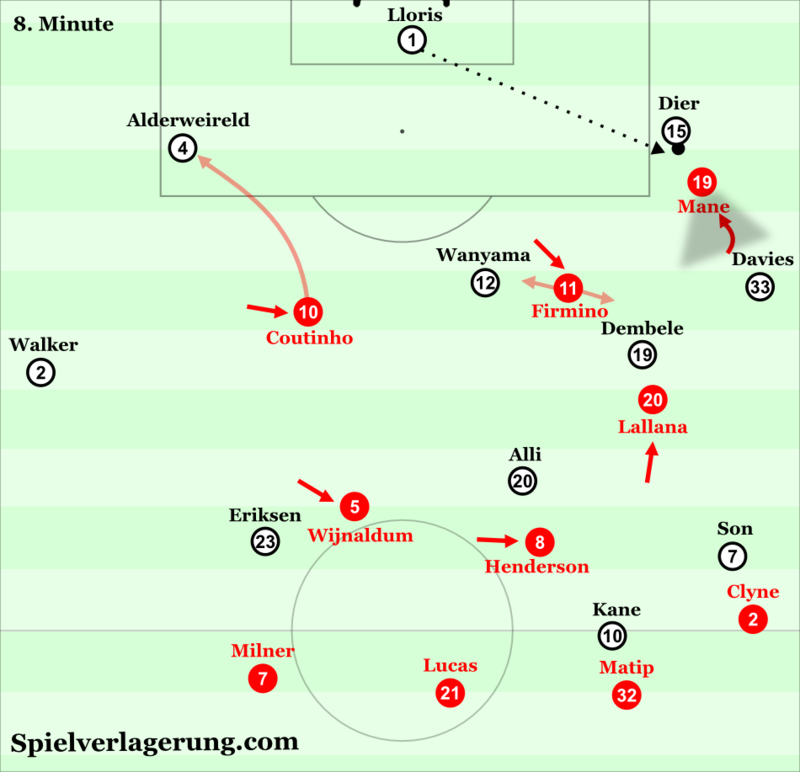 The home side themselves rarely attempted to build attacks from deep, perhaps wary of Tottenham’s pressing, instead focusing on a direct approach and positioning themselves for 2nd balls and counterpressing. Wijnaldum and Lallana were key to this, starting in narrow positions near the ball they were also positioned fairly deep, allowing them to run onto loose balls or use their forward momentum for counterpressing. With both sides unable or unwilling to build attacks cleanly through the pressure of their opponents there were numerous sideline battles in the 2nd half. Under intense pressure, long balls to the flanks were often the go-to option since they initially represented the areas of greatest respite from the opponents. However, players on both sides struggled to combine their pressing in wide areas, with an adequate awareness of their team-mates’ positioning and viable exit routes. Thus, both sides were often forced into aimless long balls when regaining the ball in these situations. Alternately these sideline battles led to a number of set-pieces caused either by the proximity of the touchline or over-zealous challenges in an attempt to prevent the opponent escaping and accessing the underloaded flank. Klopp’s side finally secured their first league win of the new year and the convincing manner of the victory will have the Anfield faithful hoping of a return to their form of the first half of the season. The impact of Mane’s presence was visible, as was their continued ability to dominate clashes against fellow top-6 rivals. With only league games left in the season, and the return of Mane Liverpool look primed for a strong finish to the season. Although it appears too late for a title challenge, it will give them a strong chance of a top four finish. Defeat for Pochettino’s men leaves them in danger of losing 2nd spot, and only 2 points above 6th spot. The North Londoners are embroiled in a 5-way battle for the 3 remaining top four positions and the Europa League may take on increased significance as a back-up route to next season’s Champions League.